Watch and learn about all the hottest new saltwater fishing rods, reels, lures, and rigs, as the SaltwaterFishing 24/7 editorial staff, expert pro staff, and seasoned field staff, review some of the latest and greatest gear to hit the water. Capt. Blaine Anderson, Owner of Anderson Guide Services, talks about the benefits of using the Daiwa Saltiga Boat Braid saltwater fishing line, as well as the differences between it and other braided lines on the market. Daiwa Saltiga Boat Braid Saltwater Line Review -- Capt. Blaine Anderson, Owner of Anderson Guide Services, talks about the benefits of using the Daiwa Saltiga Boat Braid saltwater fishing line, as well as the differences between it and other braided lines on the market. 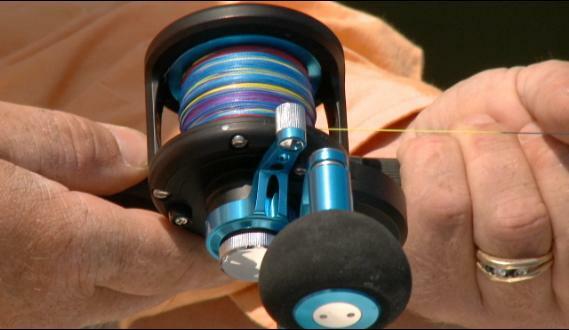 Daiwa 2009 Saltist 2 Speed Reel Review -- Capt. Blaine Anderson, Owner of Anderson Guide Services, goes over all the high performance additions Daiwa put into the new Saltist 2 Speed conventional reel this season.